Before I start collecting feedback on the Bigdaddy data center, I want to talk a little bit about canonicalization, www vs. non-www, redirects, duplicate urls, 302 “hijacking,” etc. so that we’re all on the same page. Q: So how do I make sure that Google picks the url that I want? A: One thing that helps is to pick the url that you want and use that url consistently across your entire site. For example, don’t make half of your links go to http://example.com/ and the other half go to http://www.example.com/ . Instead, pick the url you prefer and always use that format for your internal links. Q: Is there anything else I can do? A: Yes. Suppose you want your default url to be http://www.example.com/ . You can make your webserver so that if someone requests http://example.com/, it does a 301 (permanent) redirect to http://www.example.com/ . That helps Google know which url you prefer to be canonical. Adding a 301 redirect can be an especially good idea if your site changes often (e.g. dynamic content, a blog, etc.). Q: If I want to get rid of domain.com but keep www.domain.com, should I use the url removal tool to remove domain.com? A: No, definitely don’t do this. If you remove one of the www vs. non-www hostnames, it can end up removing your whole domain for six months. Definitely don’t do this. If you did use the url removal tool to remove your entire domain when you actually only wanted to remove the www or non-www version of your domain, do a reinclusion request and mention that you removed your entire domain by accident using the url removal tool and that you’d like it reincluded. Q: I noticed that you don’t do a 301 redirect on your site from the non-www to the www version, Matt. Why not? Are you stupid in the head? A: Actually, it’s on purpose. I noticed that several months ago but decided not to change it on my end or ask anyone at Google to fix it. I may add a 301 eventually, but for now it’s a helpful test case. Q: So when you say www vs. non-www, you’re talking about a type of canonicalization. Are there other ways that urls get canonicalized? A: Yes, there can be a lot, but most people never notice (or need to notice) them. Search engines can do things like keeping or removing trailing slashes, trying to convert urls with upper case to lower case, or removing session IDs from bulletin board or other software (many bulletin board software packages will work fine if you omit the session ID). Q: Let’s talk about the inurl: operator. Why does everyone think that if inurl:mydomain.com shows results that aren’t from mydomain.com, it must be hijacked? A: Many months ago, if you saw someresult.com/search2.php?url=mydomain.com, that would sometimes have content from mydomain. That could happen when the someresult.com url was a 302 redirect to mydomain.com and we decided to show a result from someresult.com. Since then, we’ve changed our heuristics to make showing the source url for 302 redirects much more rare. We are moving to a framework for handling redirects in which we will almost always show the destination url. Yahoo handles 302 redirects by usually showing the destination url, and we are in the middle of transitioning to a similar set of heuristics. Note that Yahoo reserves the right to have exceptions on redirect handling, and Google does too. Based on our analysis, we will show the source url for a 302 redirect less than half a percent of the time (basically, when we have strong reason to think the source url is correct). Q: Okay, how about supplemental results. Do supplemental results cause a penalty in Google? Q: I have some pages in the supplemental results that are old now. What should I do? A: I wouldn’t spend much effort on them. If the pages have moved, I would make sure that there’s a 301 redirect to the new location of pages. If the pages are truly gone, I’d make sure that you serve a 404 on those pages. After that, I wouldn’t put any more effort in. When Google eventually recrawls those pages, it will pick up the changes, but because it can take longer for us to crawl supplemental results, you might not see that update for a while. That’s about all I can think of for now. I’ll try to talk about some examples of 302’s and inurl: soon, to help make some of this more concrete. In the image above, the lower-left document has “nine points of PageRank” and three outgoing links. 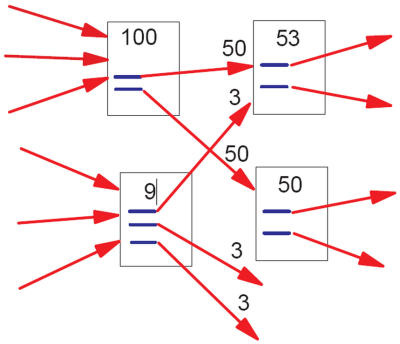 The resulting PageRank flow along each outgoing link is consequently nine divided by three = three points of PageRank. Now let’s talk about the rel=nofollow attribute. Nofollow is method (introduced in 2005 and supported by multiple search engines) to annotate a link to tell search engines “I can’t or don’t want to vouch for this link.” In Google, nofollow links don’t pass PageRank and don’t pass anchortext [*]. Q: Why did Google change how it counts these links? A: For one thing, some crawl/indexing/quality folks noticed some sites that attempted to change how PageRank flowed within their sites, but those sites ended up excluding sections of their site that had high-quality information (e.g. user forums). There may be a miniscule number of pages (such as links to a shopping cart or to a login page) that I might add nofollow on, just because those pages are different for every user and they aren’t that helpful to show up in search engines. But in general, I wouldn’t recommend PageRank sculpting. Q: Why tell us now? Q: If Google changed its algorithms for counting outlinks from a page once, could it change again? I really like the idea of sculpting my internal PageRank. A: While we can’t ever say that things will never change in our algorithms, we do not expect this to change again. If it does, I’ll try to let you know. 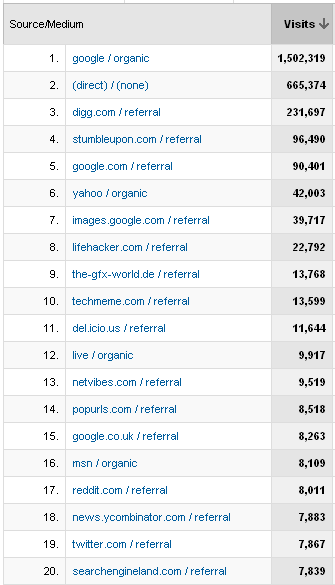 [*] Nofollow links definitely don’t pass PageRank. Over the years, I’ve seen a few corner cases where a nofollow link did pass anchortext, normally due to bugs in indexing that we then fixed. The essential thing you need to know is that nofollow links don’t help sites rank higher in Google’s search results.